On Thursday, 13th January, 2011, at about 4 a.m. the Brisbane River peaked. Reliable sources tell me (without compromising photographic evidence) that New Farm was party central the night before the Brisbane River peaked. Residents, sick of waiting for the inevitable, took to the only store that was open … the Brunswick Hotel. The bottlo did a brisk trade, with a queue ten cars long into the evening. That would be the convict spirit (pun intended) coming through – if you’re stuffed, you may as well quit worrying about it. The morning of the 13th, when the river peaked and started receding, residents could barely recognise their neighbourhood. 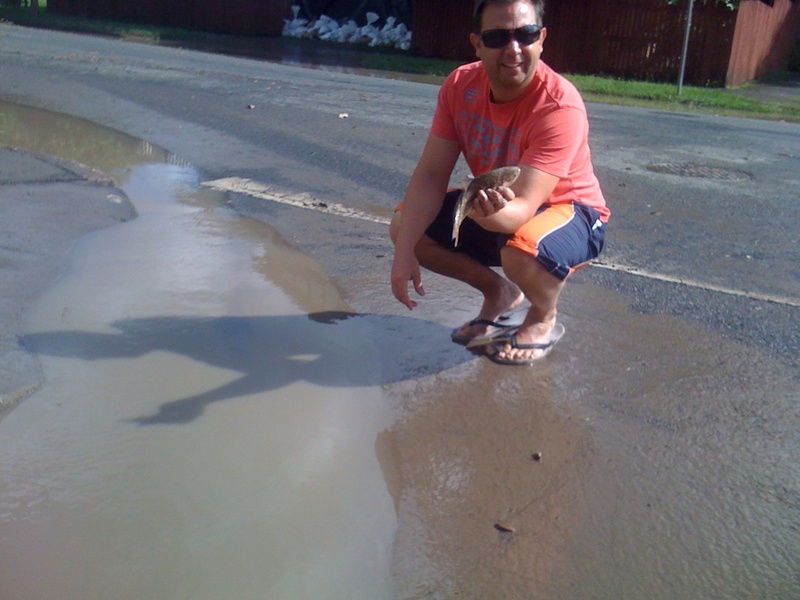 A local rescued a fish from a gutter in Villiers St, New Farm. Happily, for the fish, it was returned to the river. The fish’s name was “Max”, if you must know. We think it was a Whiting. The Auntie-who-thinks-of-everything provided me with a bunch of photos which she took for you, Dear Readers. Auntie lives in the now-swamp of New Farm. I’ll be out there cleaning stinky, burping mud with her shortly. I’ve put the images into a slideshow (below), to the haunting sounds of La Spina – Brisbane pop princess Anna-Maria La Spina & opera-singing brother, Rosario. You might want to check out their first album together, La Spina: Always You. I reviewed it here. Thanks Anna-Maria & Rosario. I know you both care a lot about your hometown. As mentioned in my post yesterday, Brisbane has lost its Riverwalk to the flood. It was due to be dismantled during the night, but eye-witness Auntie was saying her last goodbye to it at about midnight when it started making loud pinging, snapping and cracking noises, as if it were being detonated into pieces. The police present radioed it in – next thing we knew, two bits (one around 7m, the other around 70m) broke free and caused much stress – should they have knocked into a bridge, it would’ve been done for. In the morning, just before one such piece was due to collide with a bridge, a brave little tug boat came out and bumped it under safely. One wonders how much concrete now lies at the bottom of Morton Bay and precisely where. One minute, fish are swimming on concrete; next, the concrete comes to them. Very confusing times, indeed. Here are the New Farm-centric images from Thursday. Please keep Queensland in your thoughts and prayers. Article & links to volunteering here. UPDATE: Reader Lee suggests that our fish may in fact be a Bream – thanks Lee! It looks just as bad from your side of the river. We have just spent the day cleaning filth from our rental property near the ferry stop at West End. We have been watching the river rise for the last couple of days. This morning we went early this morning to find the river had left our house. Fortunately it didn’t go to the top floor. We had lots of help to clean up and the job is just about done. We now have to replace the kitchen, bathroom and laundry. It could have been much worse. We finally have power at home.